Thinking about becoming an HVAC technician? There’s a lot to like about this career: job growth, opportunities for advancement and a relatively short HVAC training time. While the wage data for 2019 won’t be out until the end of the year or later, looking at the most current salary information for HVAC techs can help give you an idea of potential earnings. Check out the information below to see just where a career in HVAC could take you in 2019 and beyond. The HVAC career outlook is pretty strong. 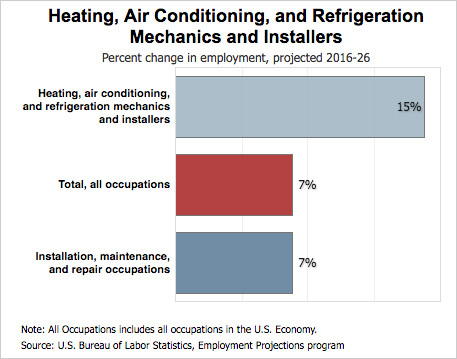 Jobs for HVAC techs are predicted to be added at a rate of 15 percent through 2026, according to the Bureau of Labor Statistics (BLS). This is more than twice as fast as the national average for all occupations. HVAC techs with knowledge of electronics, computers and troubleshooting are expected to have the best career opportunities. HVAC technician salary varies across sectors and locations for several reasons. A recent survey by Connect Team, an app for non-desk employees, can lend more insight into HVAC salary across the industry based on job title, education and experience.With HVAC equipment becoming increasingly technologically advanced, education and certificates are proving to have the greatest impact on earnings, accounting for a 20-40 percent jump in salary, depending on the credential awarded. At the same time, hands-on experience has lost some of its value compared to education. The survey found that education was the biggest factor in boosting the pay for HVAC techs. More than half of HVAC technicians, 61 percent, had some form of professional education. More time working in a specific field often means greater productivity. Workers who get more done can tend to have higher earnings, according to the BLS. How can HVAC technicians gain a competitive advantage in the field? As the BLS points out, the increasing number of complex HVAC systems will be one source of job growth in coming years. But only for qualified techs. While HVAC technicians can learn the fundamentals of the trade in an HVAC program at a trade school, it can also be helpful to stay current with industry trends. Many factors can contribute to how much you could take home as an HVAC technician. But education can make a difference in career opportunities and pay. If you’re interested in the HVAC career path, enrolling in an HVAC program can be a good place to start. There’s much to learn in an HVAC school.